NOW AVAILABLE TO OWN ON DVD! 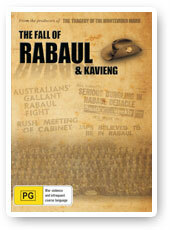 The DVD of The Fall of Rabaul and Kavieng is now available to purchase. This 2 disc set features no less than 4 hours of riveting material including extensive coverage of the events at Parliament House Canberra on the 21st of June 2010.Includes all the speeches in the House of Representatives and Senate plus interviews at Parliament House gauging the reactions of relatives and veterans attending this historic occasion. There are "no punches pulled" when it comes to criticism by some interviewees of those whose bungling decisions resulted in tragic, significant and unnecessary loss of Australian lives. The second 2 hour disc features detailed interviews with those who survived the 1942 invasion of Rabaul and Kavieng combined with rare archival film and stills. Dear Second World War Veterans and Widows: Please advise when ordering a DVD as we would like to gift to you a DVD of your choice from our web site free of charge.